CK Special Gases work very closely with CONCOA, the leading global manufacturer of high quality gas equipment; with their regulator range being the best available in the market. Delivery lead times for many of CONCOA’s products can be as little as 10 days, from production to your door, we find their quality, service and support unbeatable. If we hold the product in stock, you can have it the next day! Having worked with CONCOA for over 25 years, we can also vouch 100% for the robustness and manufactured quality of their product range – with the vast majority of their regulators being traded out for new equipment due to regulation and best practice, not due to failure or fatigue. Our supplies of CONCOA branded equipment grows year on year as our customers continue to appreciate the benefits of purchasing a branded product of CONCOA’s quality, rather than cheaper and inferior products. When considering true lifetime costs, we are confident that CONCOA is without doubt the best in the market – it is our estimation that true life cycle costs can be reduced by as much as 25% by choosing CONCOA equipment. Every regulator comes with a 10,000 cycle assurance. The CONCOA 420 and 430 SilcoNert 1020 Series were specifically developed for the H2S, reduced sulphur, Mercury and low level NO2 and SO2 environmental mixtures. The inert amorphous silicon coating ensures superior stability and greater calibration accuracy than the bare 316L stainless steel and is ideally suited to meet new regulations for low level sulphur analysis. While all regulators can reduce pressure in a gas system, CONCOA high purity regulators conform to very exacting standards of pressure control. Below, we discuss some bases of comparison that can help you navigate this catalogue and choose a regulator that best suits your needs. Of course, our Customer Service representatives would be happy to answer any further questions you may have about regulator design and operation. Helium leak integrity is a measurement of how well a regulator prevents gases from leaking into or out of a regulator body. The measured quantity is expressed as a flow rate such as 1 x 10-9 cc/sec He (1 billionth of a cc/sec). In this case, a Helium Leak integrity rating of 1 x 10-9 would indicate that the regulator would leak enough gas to fill one cubic centimeter every 33 years. If the rating were 1 x 10-3, the regulator would leak enough gas to fill one cubic centimeter in just 17 minutes. Helium is used as the test gas because it is chemically inert, it is easy to detect, and it is an extremely small molecule with the ability to pass through the smallest leak. The lower the helium leak specification, the better the regulator will be at preventing leaks into the atmosphere and at minimizing contamination from gases outside the body. The materials of construction for a regulator should be selected based on the properties and purity of the gas being used. 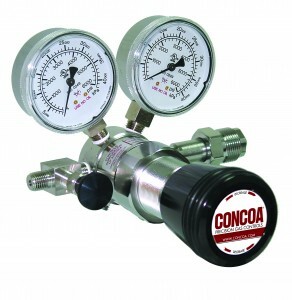 CONCOA manufactures regulators from brass, aluminum, and 316L Stainless steel. Brass is compatible with most of the non-reactive gases. A choice of forged body or barstock construction is available. Forged body regulators are economical; however, their internal surface finishes are relatively rough as compared to barstock body regulators. Barstock body regulators have all wetted surfaces machined to a smooth finish, which reduces the possibility of contamination. 316L Stainless Steel is highly corrosion resistant and is suitable for use with many of the highly corrosive gases in their anhydrous form. Aluminum is an economical lightweight alternative to stainless steel for many of the mildly corrosive gases. Refer to the compatibility charts on pages 10-11 or consult your gas supplier to determine suitable materials of construction. CONCOA manufactures cylinder connections which conform to all worldwide standards. In the US the Compressed Gas Association (CGA) has designated specific cylinder connections for each gas service and pressure rating. Refer to CGA publication V-1 for more information. A few of the international standards CONCOA provides include DIN 477, BS 341, JIS (Japan), and KS (Korea). Please note that a CGA connection limits the temperature range of a regulator to the guidelines of the connection. The flow charts found on pages 160-165 are a graphical representation of test results which show the change in outlet pressure. To use the chart, determine the maximum no-flow pressure permitted by your system. Locate this pressure on the vertical axis of the chart. If there is no curve for your specific condition, interpolate a curve. Follow the curve to the desired flow rate on the horizontal scale. Read horizontally to the left to determine the corresponding pressure drop. Because flow rate is dependent upon inlet pressure, data is presented at full cylinder pressure (2000 PSIG), partially full (500 PSIG), and nearly empty (200 PSIG). The diaphragm is a sensing element crucial to the function of the regulator and the purity of gas delivery. Stainless steel diaphragms are corrosion resistant and have low leakage rate characteristics. Neoprene diaphragms may offer more sensitive pressure control, but do not offer the gas purity of stainless steel. Coating a neoprene diaphragm with PCTFE enhances gas purity greatly. While a single or dual stage regulator of the appropriate material will suffice in most gas services, some applications require specially designed regulators. For example, in the 400 Series, the 455 Series regulators are specifically designed for use with highly corrosive gases, and the 492 Series regulators can safely deliver gas at extremely high pressures. Regulators with SilcoNert™ 1020 such as the 420 Series, 430 Series and the 515 Series are ideal for low sulphur application standards and calibration. If you are unsure about your requirements, please contact CONCOA for assistance. To meet the rigorous requirements of end-users in the analytical, scientific and electronics markets. CONCOA has developed a unique regulator seat assembly that incorporates the numerous individual parts of a standard regulator seat into a single component. This design allows the Capsule® to be tested as a separate component prior to assembly into the regulator. The complete regulators are also 100% tested giving the seat, or “heart” of the device, a double test. The result is longer life and reliable performance. 1. Lateral Flow Passages – Instead of impinging directly on the diaphragm, the gas enters the low pressure chamber through a side orifice of the Capsule®. This smooth transition from high pressure to low pressure reduces the effects of gas surge on the diaphragm and minimizes regulator hum. In addition, the lateral flow passages induce a swirling effect which yields a completely swept internal cavity for complete purging. 2. Multiple Orifice Sizes – Each regulator have a specially designed Capsule® to optimise regulator characteristics over a broad range of applications. However, there are applications requiring higher or lower flows than the standard Capsule® can offer. By substituting a Capsule® with a larger or smaller orifice, CONCOA can tailor the regulator to meet a specific requirement. 3. PTFE Seat – The standard seat material is high density PTFE. PTFE is an inert material which will not react with or contaminate any high purity gas. In addition, PTFE retains its sealing properties over a wider temperature range than other seat materials. The inlet pressure rating of all CONCOA regulators with a PTFE seat is 3000 PSIG (210 BAR). With the optional PCTFE-seated Capsule®, the pressure rating increases to 4500 PSIG (310 BAR). 4. High Load Marginal Spring – The purpose of the marginal spring is to close the seat independently of gas pressures. The innovative CONCOA Capsule® utilizes a high force spring that assures a gas-tight seal under all conditions. 5. 10 Micron Filter – Particles trapped between the seat and orifice prevent proper seat closure, causing the regulator to fail. The Capsule® incorporates a 10 micron filter which completely surrounds the seat components to prevent the entrance of these damaging particles, virtually eliminating the cause of such seat failures. In addition, this filter is very fine and its large surface area is resistant to clogging which allows unrestricted flow. The 10 micron filter is a key factor in the long life and reliable performance of all CONCOA regulators. The stainless steel 10 micron mesh Capsule® is patented CONCOA technology.